Formulated as a complete and balanced product, this formula is designed to promote the long-term health of cats with normal to low activity levels. This highly digestible formula is made with high-quality ingredients and is magnesium controlled and pH balanced. It also contains omega fatty acids for a shiny coat and added taurine for proper eye and heart health. Chicken meal, ground maize, brewers dried rice, maize gluten meal, chicken fat, dried plain beet pulp, fish meal, linseed, chicken digest. 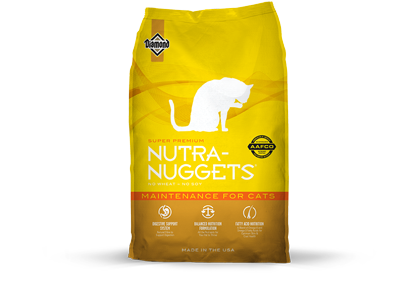 Nutra-Nuggets Maintenance Formula for Cats is formulated to meet the nutritional levels established by the AAFCO Cat Food Nutrient Profiles for maintenance.